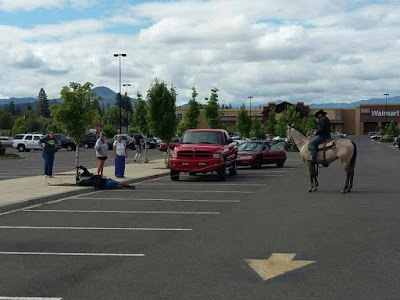 Cop in the Hood: "Rancher on horseback lassos bike thief"
Redneck or not, a man who has a lasso handy and knows how to use it? Respect! Not a bit of disrespect. Personally I find rednecks to be fun to be around and generally handy when my car breaks down or I need to build a garage or other useful things. The horse and lasso are just gravy. Also, as a real cowboy, he assuredly does have an actual red neck!